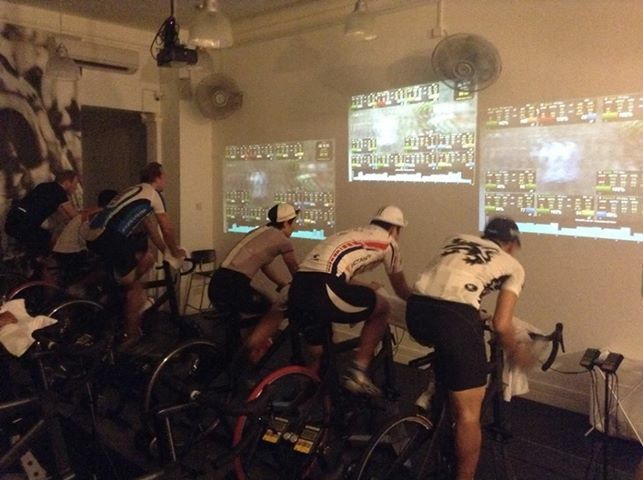 Over the last few days I have had a number of enquirers about the ‘how the hell to you train for a Deca Ironman in Singapore?’/’I mean how do you cycle in Singapore anyway?’. Many of these emails are from cyclists coming from UK/Australia/New Zealand/France etc to Singapore in 2014 – and the general tone is ‘Is this the end of my cycling days?’. So chances are if you are an expat in Singapore you work in the finance sector and therefore probably ‘shackled’ to the desk & working long hours in the CBD – at least for a while. As a cyclist, don’t panic. 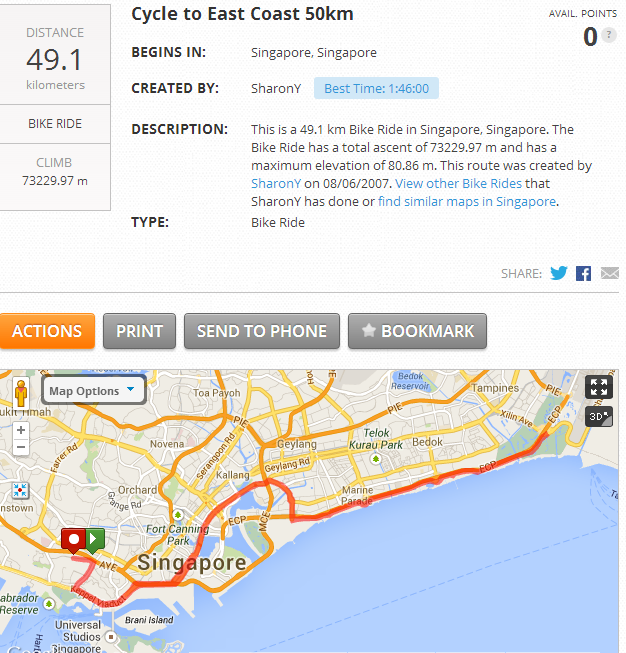 Lets look quickly at what parts of Singapore’s geography is good for cycling. The island/city state is about 716.1 km2(276.5 sq mi) today (about the size of the Isle of Wight) with only 250 acres of farmland remaining. The highest natural point is Bukit Timah Hill is 166m (545ft) and about 5% of Singapore’s land is set aside as nature reserves. Urbanisation has all but eliminated primary rainforest on the main island, Bukit Timah Nature Reserve being the only significant remaining forest. Not really selling it as a mecca for cycling in South East Asia am I? 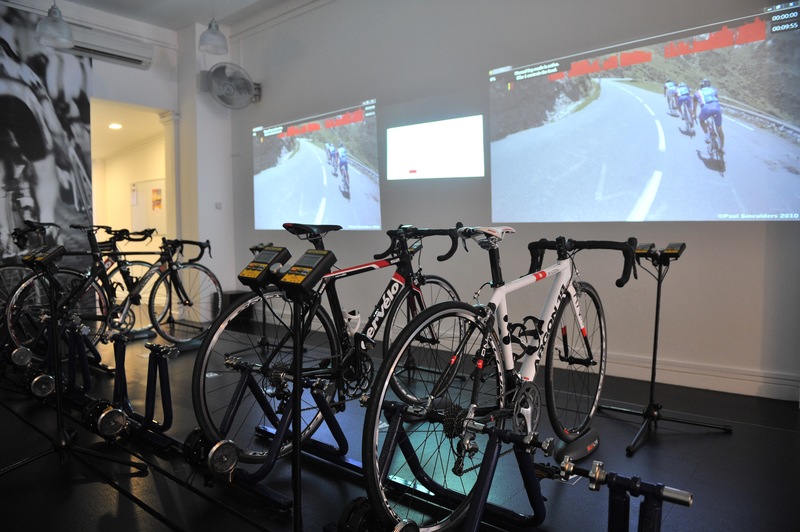 Particularly if you have ridden up the Alps, Dolomites or the rolling countryside in South-East England….. 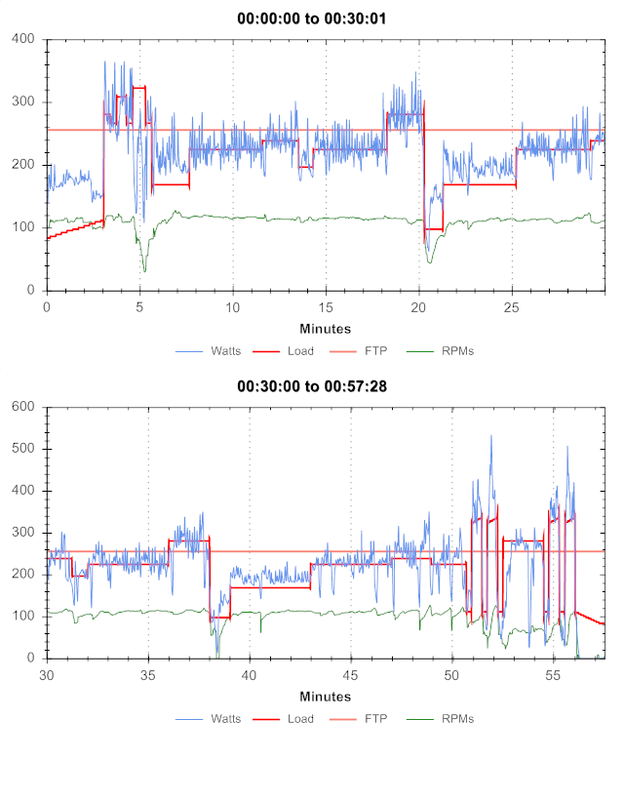 If you are just getting started in cycling you will also find there is many mass participation cycling events starting to appear in Singapore such as OCBC Singapore Cycle (which started in 2010 & the last rider number figure I’ve seen was 11,000 even in 2011). Additionally if you can’t get your bike over or looking for a new set of wheels, togoparts.com is THE place to buy new & second hand bikes/components in Singapore. 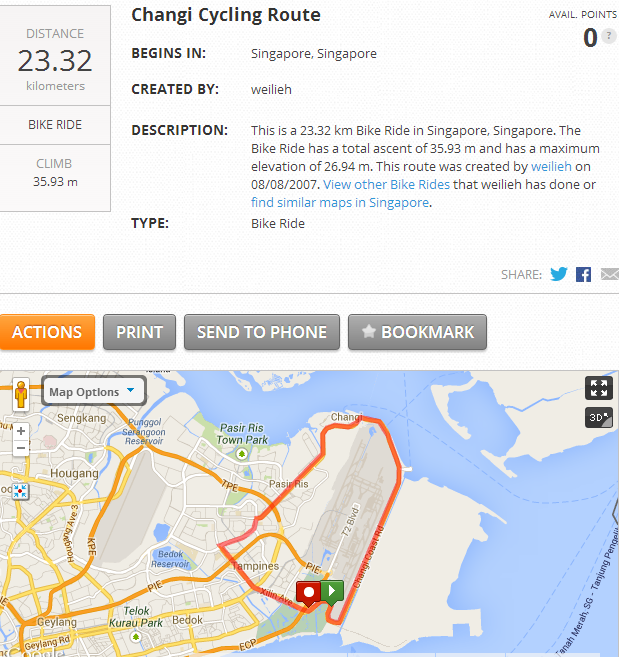 Changi ‘time-trial’ circuit as detailed on MapmyRide. 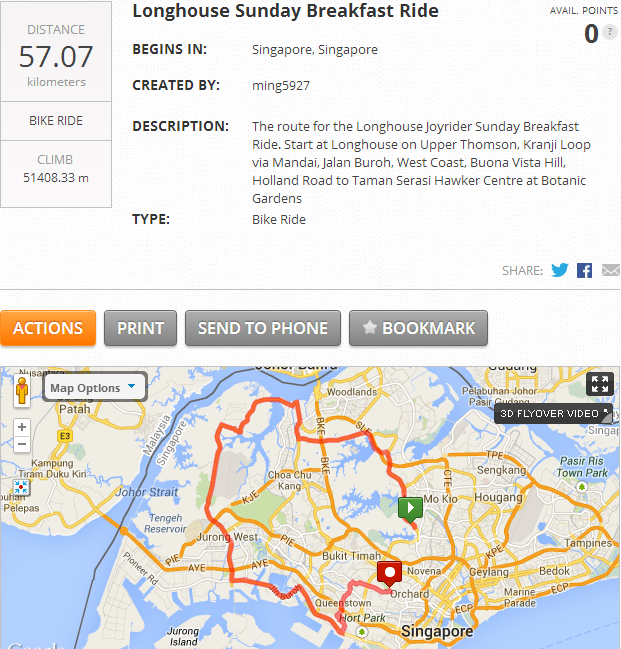 You can also link this route in with the East Coast route below which makes a solid 80+km ride. 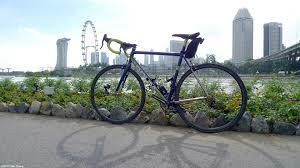 But don’t limit yourself to just circuits of Singapore, like any cycling destination you have to mix it up a bit. With a bit of forward thinking you can easily get out to the Indonesian islands of Batam & Bintan. Of course this compliments the almost limitless options of cycling throughout SouthEast Asia; some notable locations include Taiwan (the heartland of cycling manufacturing if you want to pick up a new toy and for the climbers in Singapore the landscape in Taiwan means you can have a King of the Mountains category in the Tour de Taiwan – race report from hilltop finish on Stage 2), Thailand (Challenge Laguna Phuket is one of the premier triathlon events in Asia for example & has featured top athletes year on year including 2xIronman World Champion Chris McCormack in 2013) and among others let’s not forget ‘Pick-a-triathlon’ Australia (literally the market is saturated with 70.3/Ironman and cycling races – they LOVE it). So without naming countries like a geography class, be rest assured that there are many cycling locations which you can fly to via budget airlines – AirAsia, Tiger & Jetstar. But anyway back to Bintan and Batam. This is why I am bringing up Bintan – escape the city anyone? Picture makes it a big dramatic but the island is a bit ‘urbanized’. 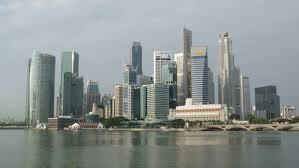 A little less urbanized in Batam. Please note Indonesian visa required but you can easily get that at the port. 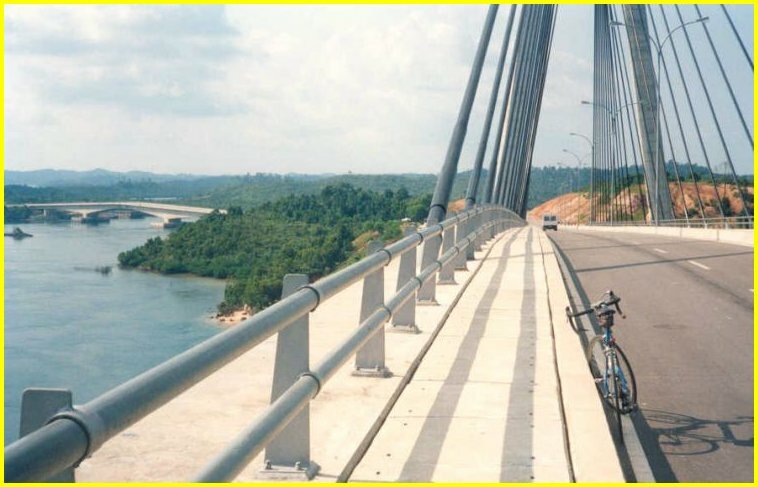 It is about 160km (with the return journey) along the length of Batam and the rolling landscape makes it an ideal ‘cycling’ weekend if you are based in Singapore. Bintan island is much the same and is again accessible via ferry – a bit more convenient than planning ‘what the hell you will do with your bike bag when you land in a new country’!?!? 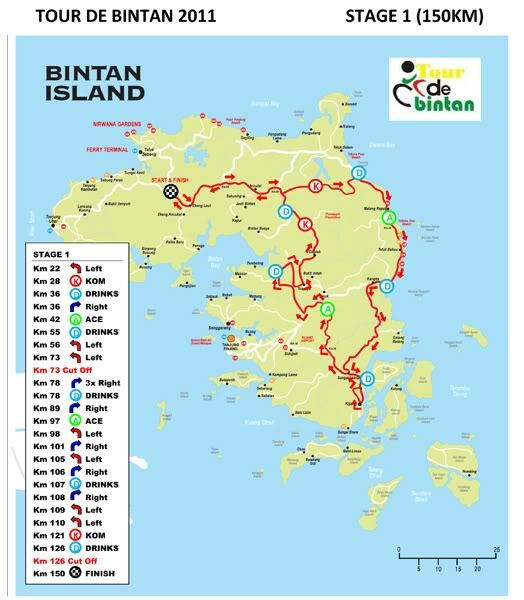 As described by the brief in the Tour de Bintan, a two stage race plus prologue on the island on 7-9 Nov 2014, the never ending rolling hills in combination with the equatorial climate provide an excellent challenge to any cyclist. So that is a brief run through of how you keep up your pursuits of becoming a pro cyclist while impounded in the ‘Golden Cage’ of a career (alright maybe that’s a little dramatic). Next time I’ll try to bring a review of the races on offer whilst you live in Singapore. 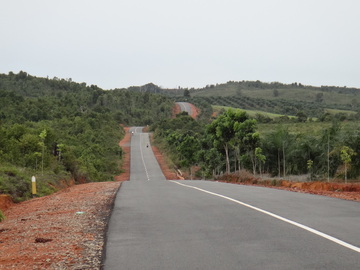 For starters there is the 96km Nongsa Challenge in Batam on 9th Feb; can’t wait!